Located along the South Branch of the Potomac River, 5 miles south of Romney, West Virginia in beautiful and historic Hampshire County. We offer over 250 sites with an abundance of shade trees, on the ridge overlooking the South Branch River Valley and in the meadow. 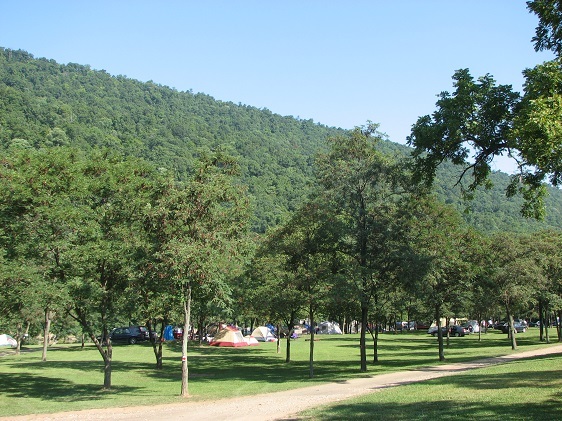 All campsites are within walking distance to over 2,000 feet of natural shoreline on the South Branch of the Potomac River. Enjoy yourself camping, walking/bicycling on our spacious grounds of over 100 acres. Bring a small boat, canoe, tube or raft and enjoy the river swimming or fishing. We are ideally located for the float trip enthusiast, as the South Branch has numerous "FREE" drop-in access areas along the river. Browse our Fishing section for some examples of trips that will float you back to our campground. Visit the historic town of ROMNEY, Ride the Potomac Eagle Excursion Train, or take a "day trip" to Seneca Rocks, Smoke Hole Caverns, Dolly Sods, Canaan Valley, Blackwater Falls; just to mention a few of the many sites in the surrounding area. Please call our office at (304) 822-5528 for current rates and reservations. We accept Cash and Check only, NO Credit or Debit at this time. 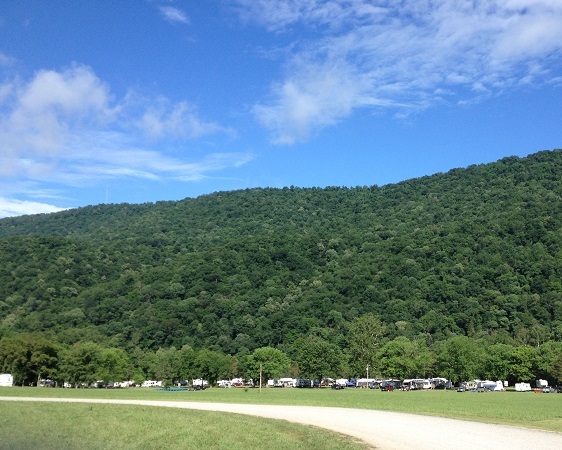 It's $5 per person for guests and non-campers to enter the campground. 193 sites with Water, Electric and Sewer hookup. 20, 30 & 50 AMP Hook-up available (call for details). Pets are permitted, except Pit Bull Species "We apologize for the inconvenience"
All pets must be on a leash. Quiet Time is 11 P.M.-7 A.M.
We are open from Mid April through October depending on seasonal weather conditions.